Not long after the Armistice the grim job of finding the fallen on the battle fields began. Shown above is a small part of a British Imperial War Graves Commission Body Density Map. The numbered map squares are 1000 yards on a side or about 207 acres. Each is divided into four smaller squares that are 500 yards on a side or about 52 acres. The blue penciled amounts are the number of bodies or distinct remains recovered in the 52 acre plot. Although supervised by British personnel, the actual recovery and reburial work was performed by the Chinese Labour Corps. 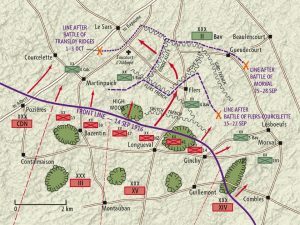 This particular map shows ground covered by the Battle of Flers-Courcelette (Sept. 15th to 23rd, 1916), which was a part of the Somme Offensive. 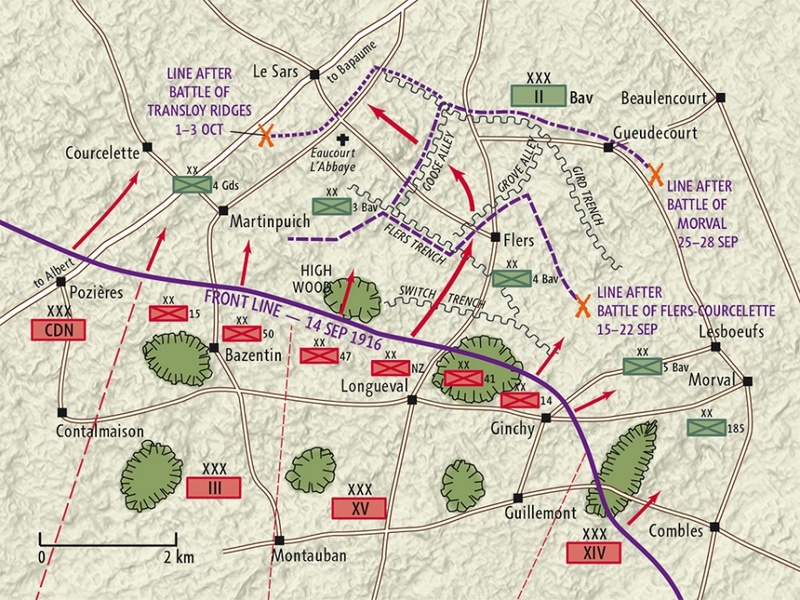 At the time this engagement was considered a British victory, as the front was moved forward about 3,500 yards. This occasion marked the first use of tanks in history. Total casualties (killed, wounded and missing) for the British forces were 29,376; an exact number for German losses is unknown, but thought to be around half the British total.